The health harms of injecting drug use include HIV, hepatitis C, bacterial infections, overdose, and substantial excess mortality. An estimated 16 million people inject drugs worldwide, 3 million of whom live in eastern Europe.1 Around 1.5 million people are infected with HIV in eastern Europe, with most infected through injecting drug use.2 The largest European epidemics are those in the Russian Federation and Ukraine, where over a third of injecting drug users are thought to be HIV positive.1 2 One contributing factor is policy resistance to harm reduction. Epidemiologist Elizabeth Pisani and other leading commentators describe which countries are leading the way in tackling HIV infection among injecting drugs users in this 10 minute BMJ video. Moreover, harm reduction interventions are more effective when they are combined.10 For example, a cohort study in Amsterdam showed that “full participation” in combined syringe exchange and opioid substitution programmes reduced incidence of HIV by two thirds, whereas participation in syringe exchange alone was not associated with a reduction in HIV incidence.12 Initiation and adherence to antiretroviral HIV treatment also improves when access to opioid substitutes is good.13 The enhanced effects of combining opioid substitution with syringe distribution and antiretroviral HIV treatment are particularly relevant for countries with large HIV outbreaks. Although harm reduction is central to European Union policies, some countries are resistant to this approach. The United States, for instance, has long acted as a force of resistance to harm reduction on the global stage and nationally. It has emphasised a “war on drugs” policy, which, until recently, promoted federal or state restrictions on the funding and evaluation of syringe distribution programmes.14 In Russia, there is also strong resistance to harm reduction. The use of methadone and buprenorphine in treating opioid dependence is legally prohibited, syringe distribution programmes lack adequate coverage and political support, and the primary emphasis on law enforcement and the criminalisation of drug use create an environment that can exacerbate HIV risk and other harms. Russia prohibits the use of methadone and buprenorphine (or other opiates) to treat opioid dependence, despite international pressure and good evidence supporting opioid substitution treatment.4 5 WHO defines it as an “essential medicine,” and substitutes are prescribed to over 650?000 people in Europe. Treatments for opioid users in Russia are instead modelled on alcohol detoxification, oriented to alleviating short term symptoms of withdrawal, and have high relapse rates.16 17 With heroin more accessible than substitution treatment, opportunities for preventing HIV infection are reduced. Russia has only about 75 needle and syringe programmes for its two million injecting drug users.1 Such programmes do not “violate” the national criminal code, as the health minister suggested, but one reason for their poor coverage remains a fear that distribution of syringes may be interpreted as promoting drug use under article 230 of the Criminal Code (1996). In 2003, an amendment to this article exempted the provision of health equipment, subject to the agreement of regional representatives of the Ministry of Health and Federal Drug Control Service. Formal instructions on this agreement have yet to be instituted, even though studies do not show that syringe distribution programmes encourage drug use or “social tolerance” of it.5 10 If it was not for the availability of cheap needles and syringes from pharmacies, HIV rates could be worse. Aside from Russia, only three countries in the European and central Asian region do not provide opioid substitution treatment: Tajikistan, Turkmenistan, and Uzbekistan.9 20 Uzbekistan discontinued its programme for about 150 users last year. Tajikistan plans to pilot opioid substitution treatment, partly to prevent jeopardising international health funding.20 Other programmes in central Asia operate as fragile pilots with little evidence of meaningful expansion. One of the largest is in Kyrgyzstan, providing treatment to about 950 people. The programme was threatened with closure in 2009, and like many others in the region relies heavily on international funding. What effect might legalisation of opioid substitution treatment have in Russia? We carried out simulations using a dynamic model of HIV transmission in injecting drug users for different types of HIV epidemic in Russia. We estimated the effect of current syringe distribution programmes, optimistically assuming that they reduce the average syringe sharing frequency of all reached participants by 75%.6 Studies suggest that opioid substitution treatment can reduce risk of HIV infection by 60-84%, and we used this range in our simulations.4 A full description of the model is available on bmj.com. The figure shows that the current coverage of syringe distribution programmes in Russia (10%) is unlikely to reduce HIV incidence among injecting drug users by more than 15% over five years. Conversely, increasing the coverage of opioid substitution treatment from 0% to 10%, 25%, or 50% could decrease incidence by 21% (90% confidence interval 14% to 34%), 34% (23% to 51%), or 55% (40% to 71%), respectively. Most of the uncertainty in the projections is due to uncertainty about the effect of opioid substitution and the baseline HIV prevalence of the different epidemics modelled. For example, at a prevalence of 15% (which best fits many Russian cities including Moscow), 25% coverage of opioid substitution could decrease HIV incidence by 44-53% over five years. However, if HIV prevalence is 40% or 60% (similar to that in Russian cities such as Irkutsk or Ekaterinburg), the resulting decrease in HIV incidence is reduced to 33-43% or 24-38%, respectively. Changing HIV prevalence takes longer (figure⇑, bottom). Nevertheless, increasing opioid substitution to 25% or 50% could reduce prevalence by 14% (6% to 28%) or 24% (12% to 41%) after five years. 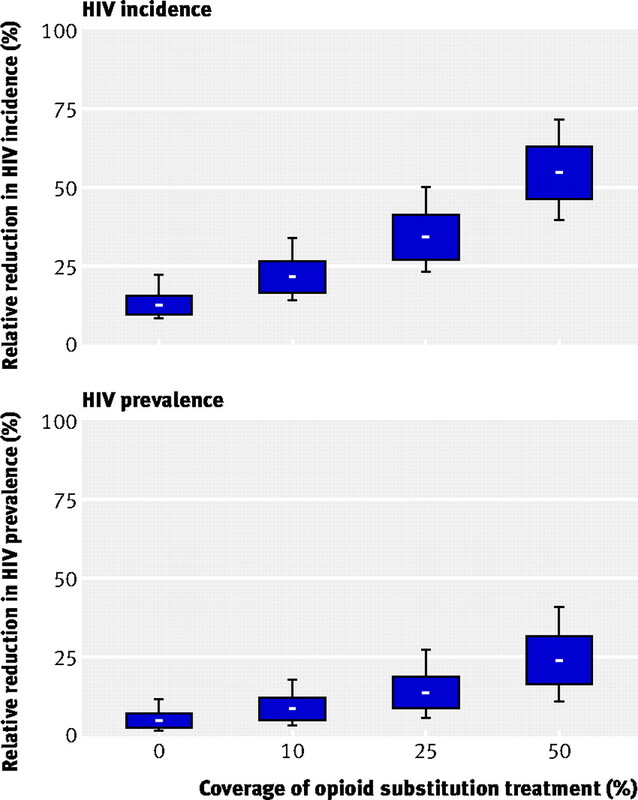 Again, the effect depends on baseline HIV prevalence, with 25% coverage reducing prevalence by 25-31%, 16-21%, and 10-17% for baseline prevalences of 15%, 40%, and 60% respectively (see bmj.com). Opioid substitution is a critical component of HIV prevention and treatment.3 4 10 12 13 Our projections suggest that Russia could substantially reduce the incidence of HIV infection if it permitted the use of opioid substitution treatment. The benefits could be even greater than we estimate as the model does not include changes in offending, or antiretroviral HIV treatment. The prohibition, by federal law or otherwise, of opioid substitution treatment limits rights of access to evidence-based health care, as championed by the UN and other international agencies.3 The roots of resistance to harm reduction in Russia are complex, and show why efforts to bring about structural changes in national laws and policies should be at the forefront of global efforts to scale-up HIV prevention. We thank Alisher Latypov, Natalia Bobrova, and the BMJ reviewers for their comments. The Centre for Research on Drugs and Health Behaviour at London School of Hygiene and Tropical Medicine acknowledges funding support from the UK Department of Health. Contributors and sources: The authors are involved in researching and working towards the development of public health approaches in HIV prevention among injecting drug users, including in Russia. TR leads social science studies on HIV prevention and treatment. AS works for a foundation that advocates for improved access to health services for drug users in Russia. PV is a mathematical modeller, and MH a public health epidemiologist. All contributed to the concept, analysis. and writing of this article, with PV and MH leading the modelling. TR is guarantor. Mathers BM, Degenhardt LJ, Phillips B, Wiessing L, Strathdee SA, Wodak A, et al. Global epidemiology of injecting drug use and HIV among people who inject drugs. Lancet2008;372:1733-45. UNAIDS. AIDS epidemic update. UNAIDS, WHO, 2009. United Nations General Assembly. Political declaration on HIV/AIDS. Resolution 60/262 adopted by the United Nations General Assembly. United Nations, 2006. Gowing L, Farrell M, Bornemann R, Sullivan L, Ali R. Substitution treatment of injecting opioid users for prevention of HIV infection. Cochrane Database Sys Rev2008;2:CD004145. Institute of Medicine. Preventing HIV infection among injecting drug users in high-risk countries: an assessment of the evidence. National Academy of Sciences, 2007. Des Jarlais DC, Kling R, Hammett TM, Ngu D, Liu W, Chen Y,et al. Reducing HIV infection among new injecting drug users in the China-Vietnam cross border project. AIDS2007;21(suppl 8):S109-14. Lert F, Kazatchkine M. Antiretroviral HIV treatment and care for injecting drug users: an evidence based overview. Int J Drug Policy2007;18:255-61. Vickerman P, Hickman M, Rhodes T, Watts C. Model projections on the required coverage of syringe distribution to prevention HIV epidemics among injecting drug users. J AIDS2006;42:255-61. Mathers B, Degenhardt L, Ali H, Wiessing L, Hickman M, Mattick RP, et al. HIV prevention, treatment and care services for people who inject drugs: a systematic review of global, regional, and national coverage. Lancet2010;375:1014-28. Degenhardt L, Mathers B, Vickerman P, Rhodes T, Latkin C, Hickman M. HIV prevention for people who inject drugs: why individual, structural, and combination approaches are required. Lancet2010 (forthcoming). doi:10.01553/S0140-6736(10)60742-8. Strathdee SA, Hallet TB, Bobrova N, Rhodes T, Booth R, Abdool R, et al. HIV and risk environment for injecting drug users: the past, present, and future. Lancet2010 (forthcoming). doi:10.01608/S0140-6736(10)60743-X. Van Den Berg C, Smit C, Van Brussel G, Coutinho RA, Prins M. Full participation in harm reduction programmes is associated with decreased risk for human immunodeficiency virus and hepatitis C virus: evidence from the Amsterdam cohort studies among drug users. Addiction2007;102:1454-62. Roux P, Carrieri MP, Villes V, Dellamonica P, Poizot-Martin I, Ravaux I, et al. The impact of methadone or buprenorphine treatment and ongoing injection on highly active antiretroviral therapy (HAART) adherence. Addiction2008;103:1828-36. Wood E, Werb D, Marshall B, Montaner JSG, Kerr T. The war on drugs: a devastating public-policy disaster. Lancet2009:373:989-90. Security Council of the Russian Federation. Stenogram of the meeting on improving the state policy in combating drugs. Kremlin, September 2009. Human Rights Watch. Rehabilitation required: Russia’s human rights obligation to provide evidence-based drug dependence treatment. Human Rights Watch, 2007. Elovich R, Drucker E. On drug treatment and social control: Russian narcology’s great leap backwards. Harm Reduction J2008;5:23. Plavinsky SL. Assessing the effectiveness of the GLOBUS project. GLOBUS Project Newsletter2008;7. Plavinsky SL. Sexually transmitted infections, HIV infection, and effectiveness of harm reduction programs in Russia. GLOBUS Project, 2009. Latypov A. Opioid substitution therapy in Tajikistan: Another perpetual pilot? Int J Drug Policy2010 Feb 23 [pub ahead of print]. Mendelevich V. Drug addiction treatment in Russia: no substitution treatment. HIV/AIDS Policy Law Rev2006;11:82-4. Babayan E, Gonopolsky MH. Textbook on alcoholism and drug abuse in the Soviet Union. International Universities Press, 1985. Bobrik A, Danishevski K, Eroshina K, McKee M. Prison health in Russia: the larger picture. J Public Health Policy2005;26:30-59. Rhodes T, Mikhailova L, Sarang A, Lowndes CM, Rylkov A, Khutorskoy M, et al. Situational factors influencing drug injecting, risk reduction and syringe exchange in Togliatti City, Russian Federation. Soc Sci Med2003;57:39-54. Rhodes T, Judd A, Mikhailova L, Sarang A, Khutorskoy M, Platt L, et al. Injecting equipment sharing among injecting drug users in Togliatti City, Russian Federation. J AIDS2004;35:293-300.